Admissions 1 Educational Consultants provide critical guidance to high school students and their parents as the students prepare to apply to college. We designed and deployed a WordPress website that emphasizes the many activities that Admissions 1 performs. A rotating header emphasizes recent blog posts. The home page summarizes the most important functions Admissions 1 carries out. The site was optimized for search, as we helped to imbue it with SEO-friendly structure and content. It is also responsive, meaning that it renders appropriately on mobile devices of all sizes. We also helped Admissions 1 to establish a Facebook business page, a Google+ business page, a Twitter account, as well as a YouTube account on which they publish their many client testimonials (we also put the video testimonials together with raw video from Admissions 1). Additionally, we helped the Consultants to get their site found on relevant local business directories, and linked it with their newly-created social media accounts. The site includes Google Analytics and security plug ins. They know where their traffic comes from and the site is reasonably secure from attack. 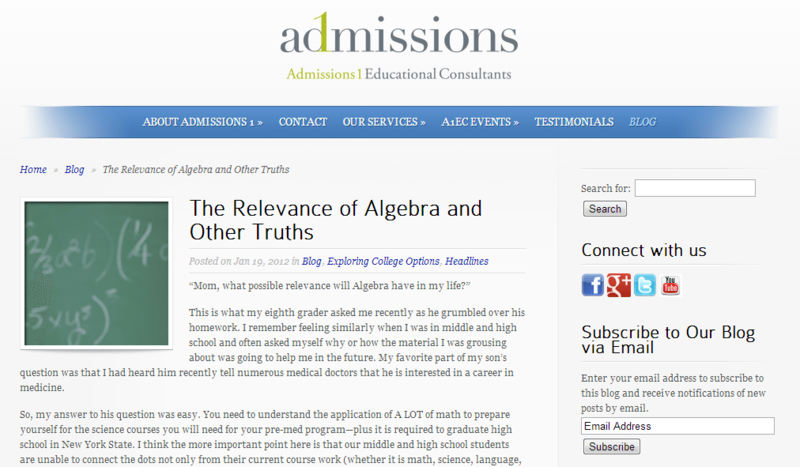 We have guided Admissions 1 over time in the strategic use of Twitter and blog updates. It’s a pleasure to work with them as they help their clients to set and achieve higher education goals.